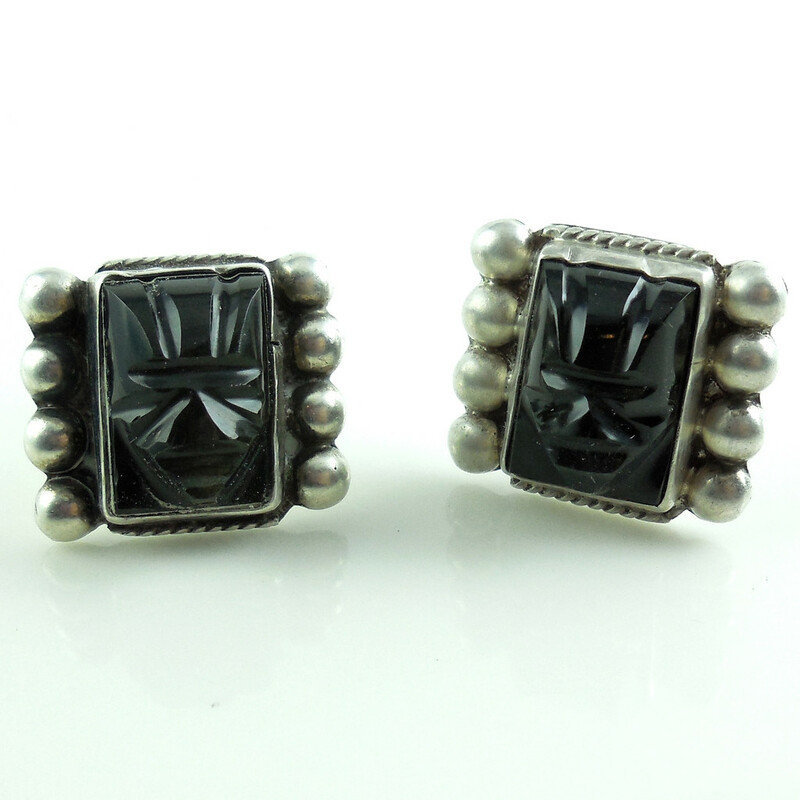 View cart “XL Vintage Southwestern SB Sterling Silver Clip Earrings” has been added to your cart. 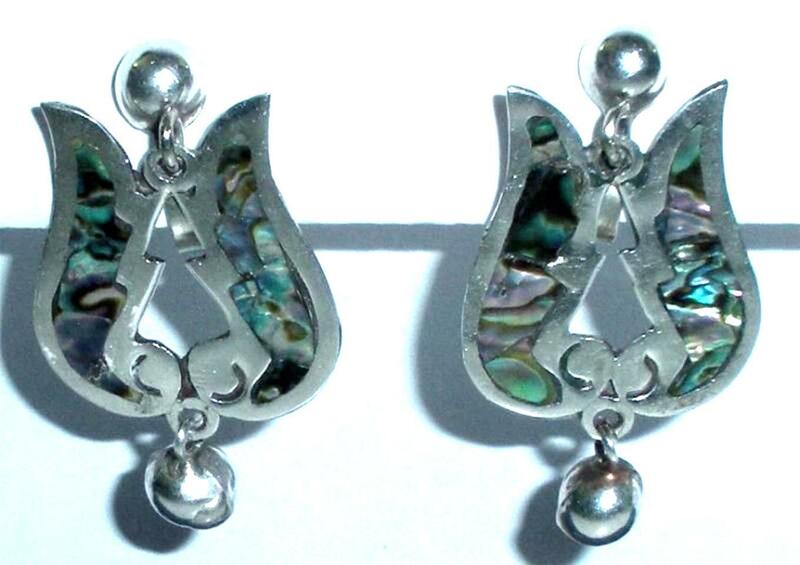 This is a pair of vintage late Art Deco hand made Mexican sterling silver and abalone mother of pearl mosaic dangle screwback earrings. Marked Sterling, 925, LCC, Hecho en Mexico. Size is 1 1/2" from top to bottom by 3/4" wide across. All original and in excellent condition this is a lovely pair of vintage statement earrings for your collection. 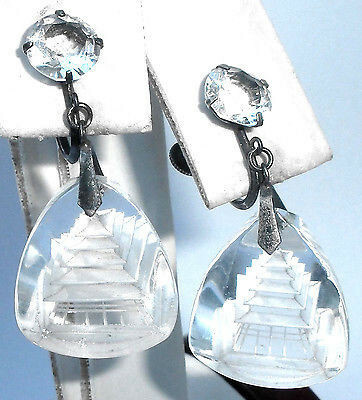 This is a pair of vintage sterling silver screwback earrings with hand etched rock crystal or glass pagoda dangles. They are marked sterling and have beautiful faceted clear crystal tops. Size of each is 1 1/2" tall by 11/16" wide across the crystals. They are nicely made with the pagoda dangles being almost 3/8" thick. Look through one side and you directly see the carved pagoda. Look through the other side and you see a clear 3D image of a pagoda. So, no matter how they dangle, they are showy and noticeable at a distance. Condition is excellent, gently used. This is a lovely pair of older vintage earrings for your jewelry collection. 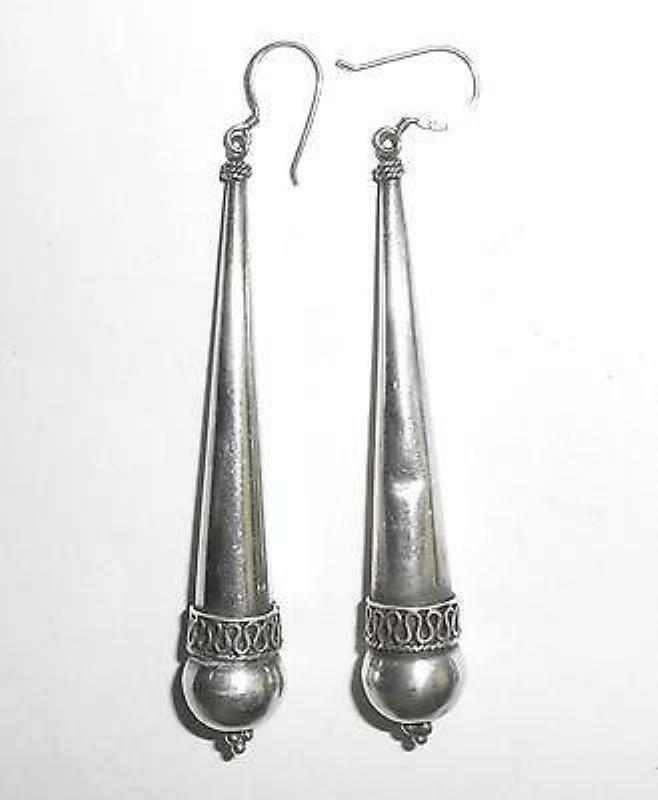 This is a very long pair of vintage handmade Balinese sterling silver dangle earrings, pierced hook dangle. Marked 925. Also tested and Guaranteed to be solid sterling silver. Size is 3.5" long from top of hook to bottom of dangle. They reach the shoulders. Weight is 14.2 grams. These are big and heavy so you can either wear them the way they are or repurpose them into pendants or something else. 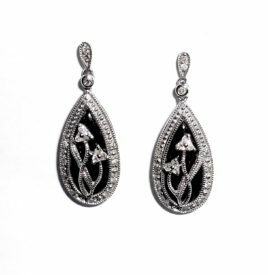 Vintage Fancy 10K White Gold Onyx Diamond Dangle Earrings - This is a very ornate pair of solid 10K white gold drop dangle earrings with natural mined diamonds and a natural mined black onyx marquise cabochon stone. They are marked 10K with maker markings. Pierced post with butterfly backs. Size is 1 3/8" tall by 3/8" wide. Onyx Stones are 16mm tall north to south, cabochon cuts, bright, shiny black. The diamonds are both bezel set on the top connectors and bezel prong set on the dangles. Total carat diamond weight is approximately .44 carat. Weight is 4.9 grams for both. Condition is excellent, very gently used. No damage or repair. The top onyx cabs are beautifully wrapped in hand applied double millgrain long stem flowers with diamond tops. 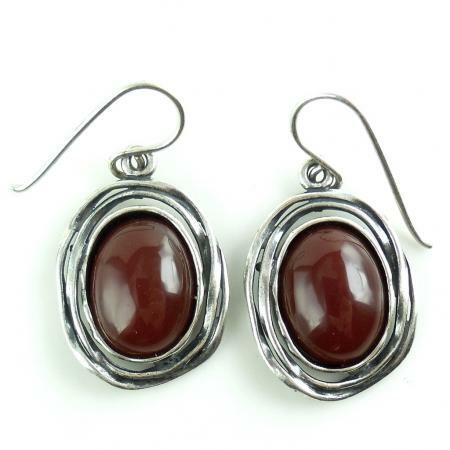 This is a beautiful, fancy pair of 10K white gold gemstone earrings for everyday use or formal wear. They are particularly pretty with the flower wraps and very ornate with millgrain delicate cut work on the edges throughout. This is a pair of hand wrought Israel 925 sterling silver modernist designer earrings with large carnelian cabochon stones. They are marked B in a circle maker mark, 925, Israel. Strong and well made made with thick solid hand wrought sterling silver and 17mm stones. No damage. Size is over 1 1/2"from the top of the hook to the bottom of the dangle. This is a lovely pair of dangle earrings for your collection. 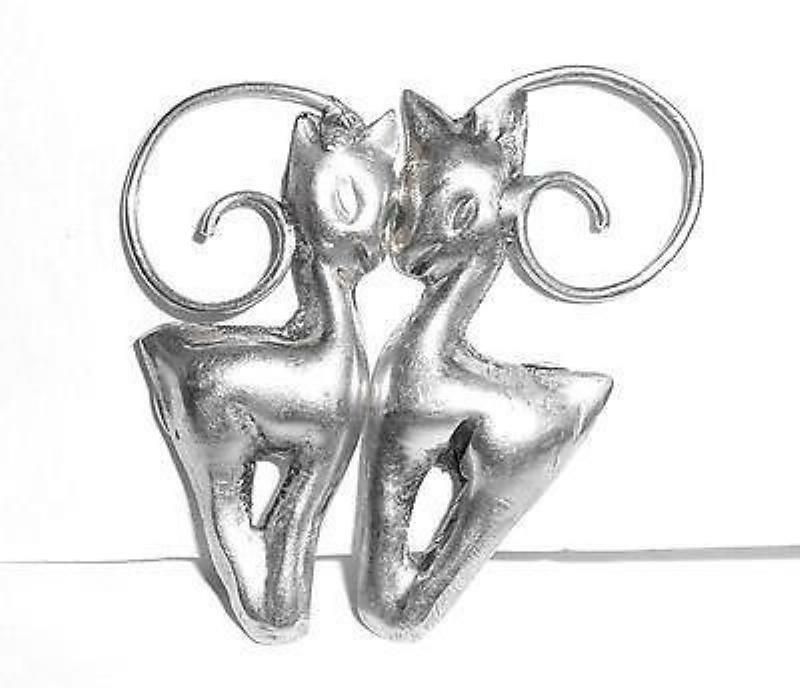 This is a pair of older vintage 1940s late Art Deco hand made Mexican Sterling Silver baby unicorn screwback earrings. Marked Mexico, Sterling. 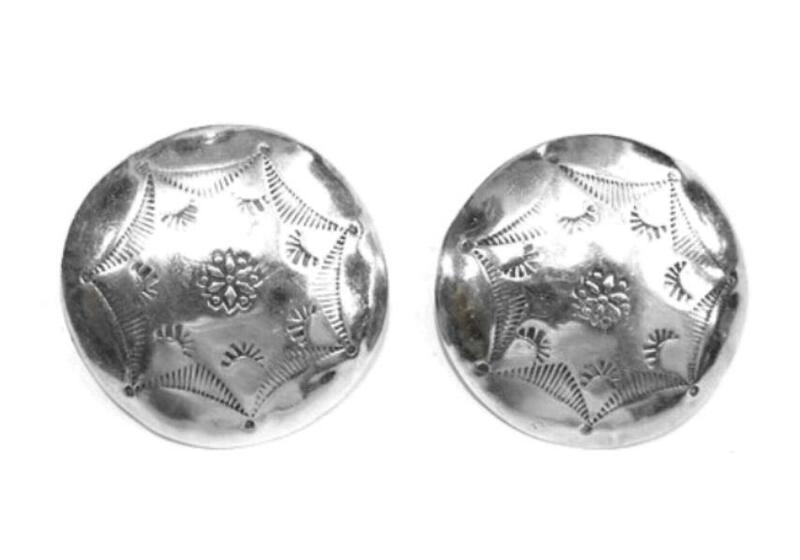 The old marking for sterling quality used by Mexican silversmiths up to the early 1950s Size is 1 3/8" tall North to South by 5/8" wide across the body East to West. A lovely pair of vintage statement earrings for your collection. The screwbacks work well, are strong and hold in place. 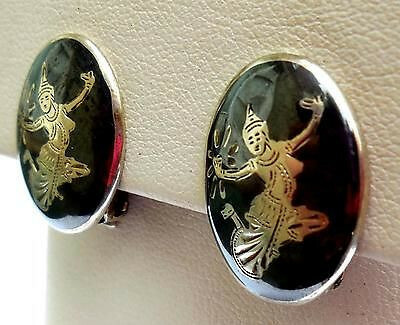 This is a long pair of vintage Siam sterling silver clip on earrings of fancy Asian Thai dancers with a dark niello finish. Marked Siam, Sterling. Also tested and guaranteed to be solid sterling silver. Size is 1 1/2" tall North to South by just about 5/8" wide East to West at the top tapering down to 1/8" wide across the bottom. The hand crafting on the dancers is very delicate and intricate. Lovely old vintage earrings for your collection. 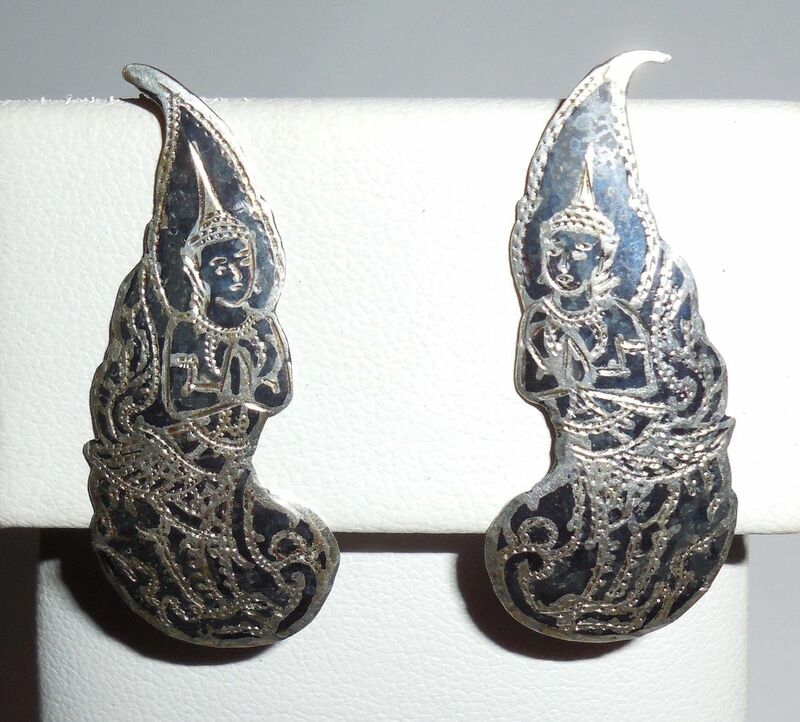 This is a medium size pair of vintage Siam sterling silver clip on earrings of fancy Asian Thai dancers with a dark niello finish. Marked Siam, Sterling. Also tested and guaranteed to be solid sterling silver. Size is 13/16" tall North to South by just about 5/8" wide East to West across. The hand crafting on the dancers is very delicate and intricate. Lovely old vintage earrings for your collection. This is a pair of old vintage mid century screwback Handmade Mexican Sterling Silver carved onyx face earrings. They are marked 925 in circle and old maker initial marks, tested, and Guaranteed to be solid sterling silver. Size is 5/8" tall. The onyx faces are deeply carved, well made and beautifully polished stone. Condition is excellent, used. Lovely vintage tribal statement earrings for your collection. 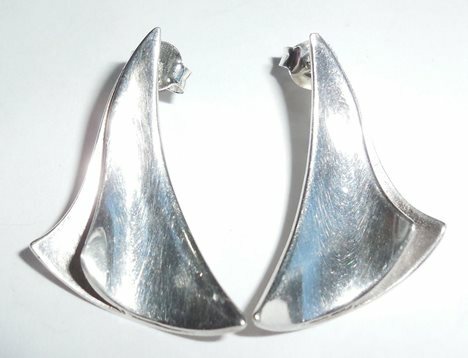 This is a lovely pair of small vintage TKF Trifari modernist sterling silver boat sail earrings. Size is 1" top to bottom on the long side by almost 3/4" wide on the bottom diagonal. A very well made pair of mid century modernist statement earrings by a well known maker in excellent condition for your collection. 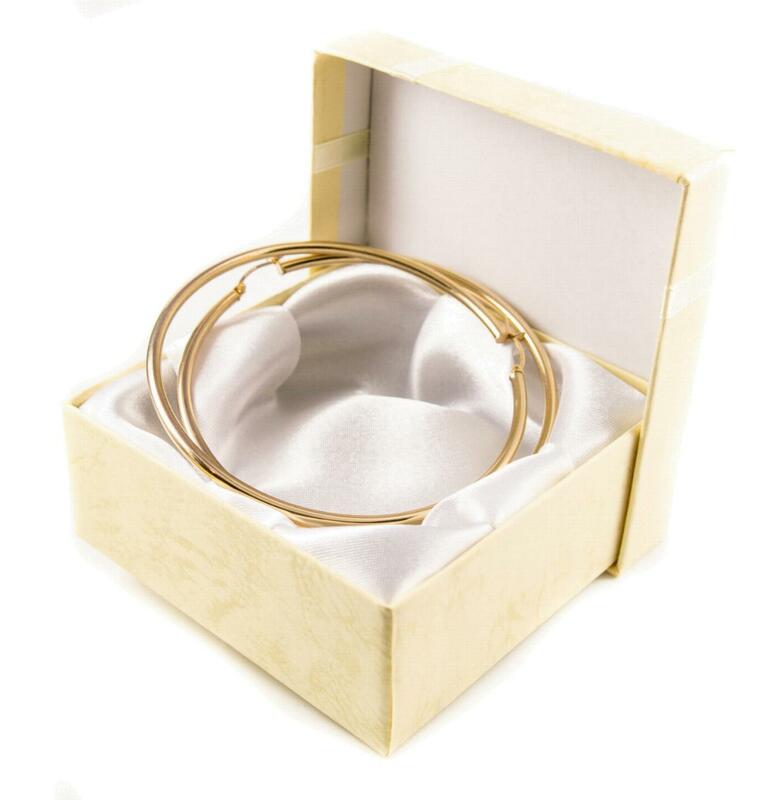 X Large 14K Gold Hoop Earrings Vintage Big Dramatic, 14K Yellow Gold Shoulder Duster Earrings Pierced Hook 6.6 grams 2 inch diameter Larger than 1/8″ across outside of hoop Very Excellent used condition. Vintage, used. Large, showy and very reflective pair of vintage Southwestern or hand cut Native American sterling silver clip earrings signed SB. Handmade, tested, and Guaranteed to be solid sterling silver. They are in vintage condition with some light faint surface scratches that can be polished out and a few tiny dings on the backs. Weight is 17.7 grams. Size measurement is 1 3/8" across; they are large and showy and cover most of the lower half of the ear. They are also well made with good, strong clips.